VATICAN CITY (CNS) — If you give the key to your heart to greed, it will leave the door wide open to vanity, arrogance and all of the other vices, squeezing God out of the way, Pope Francis said at his morning Mass. Wealth isn’t “a statue” that stands inert and has no impact on a person, the pope said June 19 during the Mass in the chapel of the Domus Sanctae Marthae. “Wealth has the tendency to grow, to move around, to take a place in one’s life and heart,” and once it moves in, fanning the desire to always accumulate more, the heart becomes “corrupted,” he said. Pope Francis said that deep down, people’s search for more is rooted in a desire for a sense of security, but there is a high risk that person will become a slave of wealth, accumulating it only for oneself and not in order to serve others. 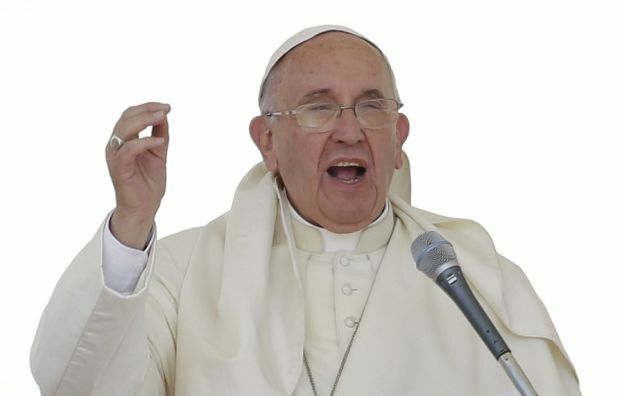 Soon, any sense of security gives way to vice and division, even in the family, he said, according to Vatican Radio. “Also the root of war lies in this ambition that destroys, corrupts,” as so many wars are being fought because of “greed for power, for riches,” he said. It’s a war that can be raging in one’s own heart, he said, “because greed keeps going, keeps moving forward,” stringing the person along a path of vice one step at a time. Greed “opens the door, then comes in vanity — to think you’re important, to believe you’re powerful — and, in the end, pride, and from there all the vices, all of them,” he said. What is important is that Christians see the goods God has given them as being at the service of others and the common good, he said. “It’s not easy to become an honest administrator (of God’s gifts) because there is always the temptation of greed, of becoming important,” he said. That is why every day we have “to ask ourselves: ‘Where is your treasure?’ In wealth or in this administration, in this service for the common good,” the pope said. Administrating the goods God has given entails not just giving away “what’s left over,” but what also is essential for oneself; it is “a continual stripping down of one’s own interests and not thinking that these riches will offer us salvation,” he said.